Tradition lives along the firing line of the 93rd Grand American World Trapshooting Tournament at Vandalia. And Joel Etchen of Ligonier, PA, is doing his part to keep it going by becoming the third generation of the Etchens to capture a major championship at the world's largest shooting tournament. Ètchen, 38 outlasted 68 shooters who broke 200 straight targets from 16 yards on Monday to win the class AA championship in a marathon shootoff. It was almost midnight when Etchen smashed the 125th straight shootoff target that gave him the AA championship, his first major shooting title at the Grand. "The biggest thing I've won before was the Pennsylvania Doubles Championship in 1991," Said Etchen, a gun store owner and automobile dealer. Joel's 200 in the program, along with Rudy Etchen's 199 out of 200, allowed the Etchens to win the parent and child Grand American trapshooting trophy with a combined score of 399 out of 400. 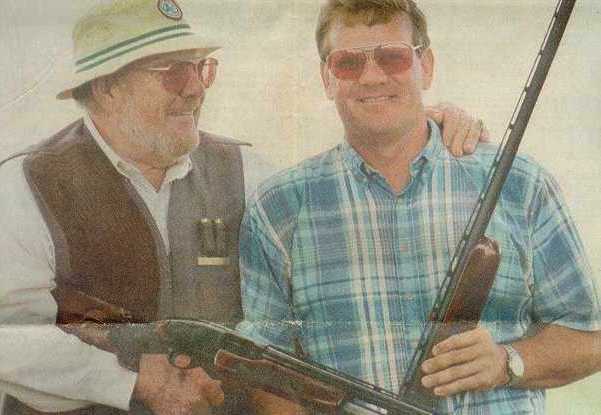 "I'm real proud of Joel," said Rudy, 69-year-old star shooter inducted into the Trapshooting Hall of Fame in 1980. The elder Etchen has won more than 40 major championships at the Grand and was the first man to break 100 straight targets in doubles at a Grand tournament. What made that first 100 in 1950 so amazing is that it was done with a pump gun. No one could believe that a shooter who had to take the time to pump a second shell in the chamber after firing at the first target could ever achieve 100 straight in the event where targets are tossed two-at-a-time. Joel said Rudy took him shooting when he was 14 or 15 years old, but the younger Etchen did not register targets with the ATA until 1981, a year after Rudy celebrated his induction into the Hall of Fame by hitting 600 out of 600 targets at the '81 Grand. "Dad did have a little advice for me before I went into the shootoff," Joel said. "He told me that at night, while shooting under the lights, you have a tendency to shoot under the targets." Joel said the toughest part of the shootoff was the 1 ½-hour delay between his first shootoff rounds and when they resumed after the Grand American opening ceremonies. For Etchen, the shootoff lasted from 7 to 11:45 p.m. Some veterans at the Grand still remember Fred Etchen, Rudy's dad. He was one of the greatest shooters ever to come out of Kansas. Besides his many victories at Grand Americans, he was captain of the U.S. Shooting Team that won a gold medal at the Olympics in 1924. The Fred Etchen was inducted into the Hall of Fame in 1979. More than 2,000 shooters in the President Anastasio Handicap and 1,900 in the Doubles Class Championship attempted to establish some of their own tradition as the shotgun tournament continued Tuesday. Eight contestants in the handicap broke 98 targets, including Ben Baumgardner of Ironton, Ohio. Area shooters who made an excellent showing included Joe Munkhenk of Lewisburg, who broke 96 targets from 27 yards, and Bruce Shoup of Tipp City, who hit 96 from 22 ½ yards. Rosemay Edmondson of Mississauga, Ontario, Canada, took the ladies division with a 96 from 25 yards, while the junior category was led by Kirby Woods of Odell, Ill., a 23 ½-yard shooter. Paul Salomon, Jr., Quantico, Va., and Robert Kranenburg, Grovertown, Ind., tied with a 96 each in the sub-junior category. The veterans and senior-veterans winners, respectively, were Walter Ford of Vineland, N.J., with a 98 from 19 yards and Jerome Keller of Hensen Beach, FL., with 98 from 18 1/2yards. Doubles shooting got off to a fast start. With about half the scores posted, four shooters had perfect scores. They were Frank Haynes, Bethaldo, IL. ; Steve Williams, Oakley, TN. ; Kent Evans, Brentwood, TN., and Frank Little, Dillsburg, PA.
Shootoffs for the handicap and doubles championship where to take place under the lights Tuesday night.